Brexit talks resume in Brussels as negotiators struggle to secure a deal on the Northern Ireland border. A leading credit ratings agency warns that Britain risks an extended recession if if fails to gain an exit agreement. Britain could permanently lose 5.5% of growth. Norway has rejected calls for Britain to temporarily join the European Economic Area after Brexit. LONDON – Britain risks an extended recession if it fails to win a Brexit deal, a leading credit agency has warned as negotiators continue to struggle to agree a deal. Standard & Poor’s, one of the big three ratings agencies responsible for the Britain’s credit rating, said on Tuesday that a no deal Brexit would trigger a lengthy recession in the UK, that would shrink the UK economy by 1.2% in 2019 and a further 1.5% in 2020. “Most of the economic loss of about 5.5 % (of) GDP over three years compared to our base case would likely be permanent,” S&P said. If the UK exits with no deal and defaults to WTO trading rules, inflation will hit 4.7% and unemployment will increase to 7.4% by 2020 – its highest level since the aftermath of the 2008 financial crash, Standard & Poor’s said. The warning came as Brexit talks resumed in earnest on Tuesday evening as UK and EU negotiators try to make a breakthrough on the Irish border question and strike a deal in time for the December summit. Olly Robbins, the UK’s most senior civil servant handling Brexit negotiations, travelled to Brussels to meet with his EU counterpart, Sabine Weyand, who works for Brussels’ chief negotiator Michel Barnier. 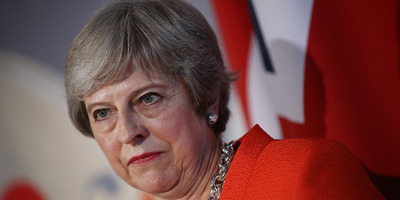 Talks are set to continue at a technical level for the rest of the week, sources close to both the UK and EU negotiating teams told Business Insider on Wednesday morning. Negotiators are trying to find a mutually acceptable version of the backstop policy for preserving the frictionless Irish border no matter what the outcome of Brexit talks and subsequent UK-EU trade deal negotiations. Back in Westminster, MPs are searching for ways of avoiding a dreaded no deal scenario. Conservative MP Nick Boles is leading calls for Theresa May to use the so-called Norway model as the backstop. Under Boles’ plan – “Norway for now” – the UK would remain in the single market and be in a new customs union with the EU until a free trade deal covering the invisible Irish border is ready to be implemented. BI understands that around 15 MPs met with Norway model campaigners to discuss the policy on Tuesday night. These MPs included Boles, plus his Tory colleagues Nicky Morgan, Stephen Hammond, and George Freeman. “But to enter into an organisation [the European Free Trade Association and European Economic Area] which you’re leaving is a little bit difficult for the rest of us,” Solberg said on Tuesday. 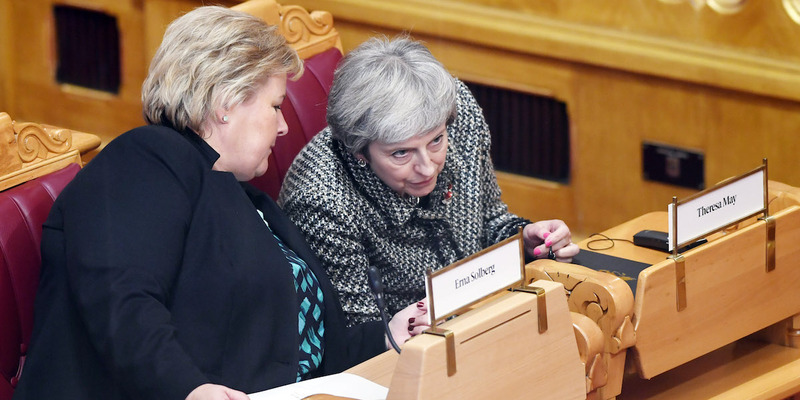 Rune Hellestad/Getty ImagesErna Solberg and Theresa May. Solberg addressed the media alongside UK Prime Minister May, who announced that all Norwegian citizens living in the UK would automatically retain all of their rights no matter what the outcome of Brexit negotiations. The prime minister’s warm words about EU and EEA citizens living in the UK were somewhat undermined by Immigration Minister Caroline Nokes’ comments before the Home Affairs Select Committee. Nokes said that under a no deal Brexit, employers will need to check that EU and EEA staff have the right to work in the UK, despite the Home Office suggesting this summer that these checks would not need to take place. 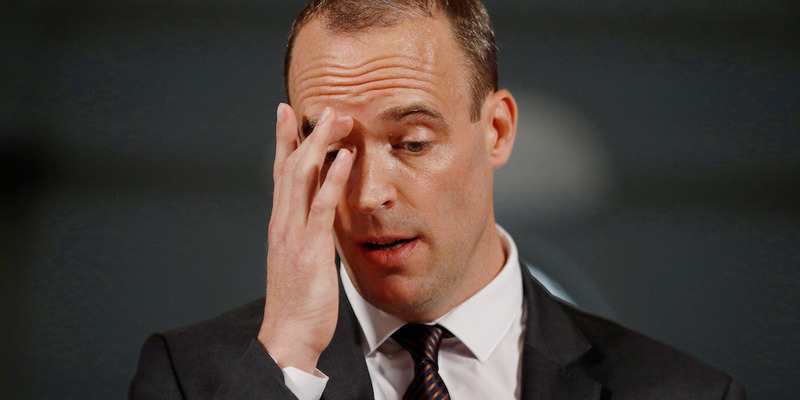 Nokes also revealed that despite exit day being just five months away, the UK government does not know what these checks would entail, while just 650 of 3.5 million EU citizens who are estimated to live in the UK have completed the settled status scheme which confirms their right to remain in the country after Brexit. An exasperated committee chair Yvette Cooper said she was “baffled” by Nokes’ remarks and exclaimed “you’ve only got five months left” to the minister and others who were giving evidence to MPs on Tuesday.